The violin, sometimes known as a fiddle, is a wooden string instrument in the violin family. Most violins have a hollow wooden body. It is the smallest and highest-pitched instrument in the family in regular use. Smaller violin-type instruments exist, including the violino piccolo and the kit violin, but these are virtually unused. The violin typically has four strings tuned in perfect fifths, and is most commonly played by drawing a bow across its strings, though it can also be played by plucking the strings with the fingers (pizzicato) and by striking the strings with the wooden side of the bow. Conducting is the art of directing a musical performance, such as an orchestral or choral concert. It has been defined as "the art of directing the simultaneous performance of several players or singers by the use of gesture." The primary duties of the conductor are to interpret the score in a way which reflects the specific indications in that score, set the tempo, ensure correct entries by ensemble members, and "shape" the phrasing where appropriate. Conductors communicate with their musicians primarily through hand gestures, usually with the aid of a baton, and may use other gestures or signals such as eye contact. A conductor usually supplements their direction with verbal instructions to their musicians in rehearsal. The Academy of St Martin in the Fields (ASMF) is an English chamber orchestra, based in London. Lincoln Christ's Hospital School is an English state secondary school with academy status located in Wragby Road in Lincoln. It was established in 1974, taking over the pupils and many of the staff of the older Lincoln Grammar School and Christ's Hospital Girls' High School, and two 20th-century secondary modern schools, St Giles's and Myle Cross. 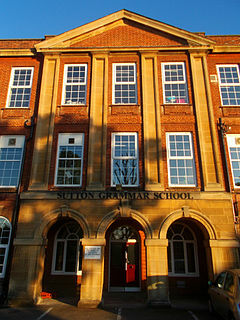 A grammar school is one of several different types of school in the history of education in the United Kingdom and other English-speaking countries, originally a school teaching Latin, but more recently an academically-oriented secondary school, differentiated in recent years from less academic secondary modern schools. Eton College is an English 13–18 independent boarding school and sixth form for boys in the parish of Eton, near Windsor in Berkshire. It was founded in 1440 by King Henry VI as The King's College of Our Lady of Eton besides Wyndsor, as a sister institution to King's College, Cambridge, making it the 18th-oldest Headmasters' and Headmistresses' Conference school. Robert Thurston ("Bob") Dart, was an English musicologist, conductor and keyboard player. From 1964 until his death he was Professor of Music at King's College London. The Philharmonia Orchestra is a British orchestra based in London. It was founded in 1945 by Walter Legge, a classical music record producer for EMI. 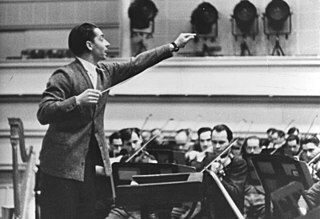 Among the conductors who worked with the orchestra in its early years were Richard Strauss, Wilhelm Furtwängler and Arturo Toscanini; of the Philharmonia's younger conductors, the most important to its development was Herbert von Karajan, who though never formally chief conductor was closely associated with the orchestra in the late 1940s and early 1950s. The Philharmonia became widely regarded as the finest of London's five symphony orchestras in its first two decades. Iona Brown, OBE, was a British violinist and conductor. Christopher Jarvis Haley Hogwood was an English conductor, harpsichordist, writer, and musicologist. Founder of the early music ensemble the Academy of Ancient Music, he was an authority on historically informed performance and a leading figure in the early music revival of the late 20th century. Alan Raymond Loveday was a New Zealand violinist. A child prodigy, he became leader of the Royal Philharmonic Orchestra, and a soloist and leader with the Academy of St Martin in the Fields. He was a professor at the Royal College of Music for 17 years from 1955. Loveday married pianist Ruth Stanfield in 1952, and they had two children, including Ian Loveday. Los Angeles Chamber Orchestra (LACO) is an American chamber orchestra based in Los Angeles, California. LACO presents its Orchestral Series concerts at two venues, the Alex Theatre in Glendale and UCLA's Royce Hall. The Minnesota Orchestra is an American orchestra based in Minneapolis, Minnesota. Founded in 1903, the Minnesota Orchestra plays most of its concerts at Minneapolis's Orchestra Hall. The Stuttgart Radio Symphony Orchestra was a German radio orchestra based in Stuttgart in Germany. The ensemble was founded in 1945 by American occupation authorities as the orchestra for Radio Stuttgart, under the name Sinfonieorchester von Radio Stuttgart. The radio network later became the Süddeutscher Rundfunk, and the orchestra changed its name in 1949 to the Sinfonieorchester des Süddeutschen Rundfunks. In 1959, the orchestra took on the name Südfunk-Sinfonieorchester, and acquired its current name in 1975. The Daily Telegraph, commonly referred to simply as The Telegraph, is a national British daily broadsheet newspaper published in London by Telegraph Media Group and distributed across the United Kingdom and internationally. It was founded by Arthur B. Sleigh in 1855 as Daily Telegraph & Courier. Baroque music is a period or style of Western art music composed from approximately 1600 to 1750. This era followed the Renaissance music era, and was followed in turn by the Classical era. Baroque music forms a major portion of the "classical music" canon, and is now widely studied, performed, and listened to. Key composers of the Baroque era include Johann Sebastian Bach, Antonio Vivaldi, George Frideric Handel, Claudio Monteverdi, Domenico Scarlatti, Alessandro Scarlatti, Henry Purcell, Georg Philipp Telemann, Jean-Baptiste Lully, Jean-Philippe Rameau, Marc-Antoine Charpentier, Arcangelo Corelli, Tomaso Albinoni, François Couperin, Giuseppe Tartini, Heinrich Schütz, Giovanni Battista Pergolesi, Dieterich Buxtehude, and Johann Pachelbel. Romantic music is a period of Western classical music that began in the late 18th or early 19th century. It is related to Romanticism, the Western artistic and literary movement that arose in the second half of the 18th century, and Romantic music in particular dominated the Romantic movement in Germany. Raymond John Leppard is a British conductor, harpsichordist, and editor. Pamela Frank is an American violinist, with an active international career across a varied range of performing activity. Her musicianship was recognized in 1999 with the Avery Fisher Prize, one of the highest honors given to American instrumentalists. In addition to her career as a performer, Frank holds the Herbert R. and Evelyn Axelrod Chair in Violin Studies at the Curtis Institute of Music where she has taught since 1996. Hilary Hahn is an American violinist. In her career, she has performed throughout the world both as a soloist with leading orchestras and conductors and as a recitalist. She also built a reputation as a champion of contemporary music. Several composers have written works especially for her, including concerti by Edgar Meyer and Jennifer Higdon and partitas by Antón García Abril. Peter Manning FRSA is a British conductor and violinist. Akiko Suwanai is a Japanese classical violinist. Keith Pascoe is a musician and conductor from Liverpool, England, best known for his work with musical ensembles such as the Chamber Orchestra of Europe, the London Philharmonic, and the RTÉ Vanbrugh String Quartet. George John Malcolm CBE KSG was an English pianist, organist, composer, harpsichordist, and conductor. Carmel Kaine was an Australian classical violinist. Wolfgang Amadeus Mozart's Horn Concerto No. 4 in E-flat major, K. 495 was completed in 1786. Christoph Koncz is an Austrian-Hungarian classical musician. He performs internationally as a violin soloist, conductor, chamber musician and principal of the Vienna Philharmonic. At the age of just nine, he received worldwide acclaim for starring as child prodigy Kaspar Weiss in the Canadian feature film The Red Violin, which won the 1999 Academy Award for Best Original Score. Andrew Marriner is a British solo, chamber and orchestral clarinettist. He became principal of the London Symphony Orchestra in 1986 following the footsteps of the late Jack Brymer. During his orchestral career he has maintained his place on the worldwide solo concert platform alongside an active role in the field of chamber music. Douglas Weiland is an English modern-classical composer. His works range from the three Sir Neville Marriner commissions: Divertimento for Strings 1992, Clarinet Concerto 2002, Triple Concerto 2006 - and two Piano Trios commissioned for Altenberg Trio Wien, to several commissioned choral works and the series of chamber works produced for the Norfolk & Norwich Music Club as their Composer-in-Residence. Enrique Arturo Diemecke is a Mexican conductor, violinist and composer. He is currently the Artistic General Director of the Teatro Colón in Buenos Aires and Music Director of the Buenos Aires Philharmonic and the Flint Symphony Orchestra in Michigan, USA. David Michael Lucian Measham was a British-Australian conductor and violinist. Skaila Kanga is a harpist and is Head of Harp Studies at the Royal Academy of Music, London, England. After winning a Junior Exhibition to the Royal Academy of Music for piano, she switched to harp studies at age 17. She studied with Tina Bonifacio, Sir Thomas Beecham's harpist in the Royal Philharmonic Orchestra. Manoug Parikian was a British concert violinist and violin professor. Kirill Troussov in Saint Petersburg, is a German violinist and violin teacher based in Munich, Germany. 1 2 3 4 5 6 7 Siddique, Haroon (2 October 2016). "Conductor Sir Neville Marriner dies aged 92". The Guardian. Retrieved 2 October 2016. 1 2 Kirby, Anthony (1 June 2000). "Sir Neville Marriner: Beyond the Academy". Lo Scena Musicale. Retrieved 2009-04-02. ↑ Higgins, Charlotte (14 February 2007). "One hundred years of attitude". The Guardian. Retrieved 2007-09-06. ↑ "Neville Marriner". NAXOS. Retrieved 2011-05-16. ↑ "Sir Neville Marriner CH, CBE". Academy of St Martin in the Fields. Retrieved 2 October 2016. ↑ Goldman, Richard Franko (April 1966). "Reviews of Records: Italian Concertos". The Musical Quarterly. 52 (2): 268–270. doi:10.1093/mq/lii.2.268. ↑ Page, Tim (2 October 2016). "Neville Marriner, who led renowned Academy of St. Martin in the Fields, dies at 92". Washington Post. Retrieved 2 October 2016. ↑ "No. 47888". The London Gazette (Supplement). 26 June 1979. p. 4. ↑ "No. 61256". The London Gazette (Supplement). 13 June 2015. p. B6. Wikimedia Commons has media related to Neville Marriner .